A small albumen print portrait of Captain John Moyer Heathcote (1834-1912), of the 1st Huntingdonshire Rifle Volunteer Corps. One contemporary source called him ‘the greatest amateur tennis player of modern times.’ He was one of the committee members at the Marylebone Cricket Club responsible for drafting the original rules of lawn tennis and is credited with devising the cloth covering for the tennis ball. Born on 12 July 1834, he was the eldest son of John Moyer Heathcote (1800-1892) of Conington Castle in Huntingdonshire. Educated at Eton and at Trinity College, Cambridge, he was called to the bar on 17 November 1859. 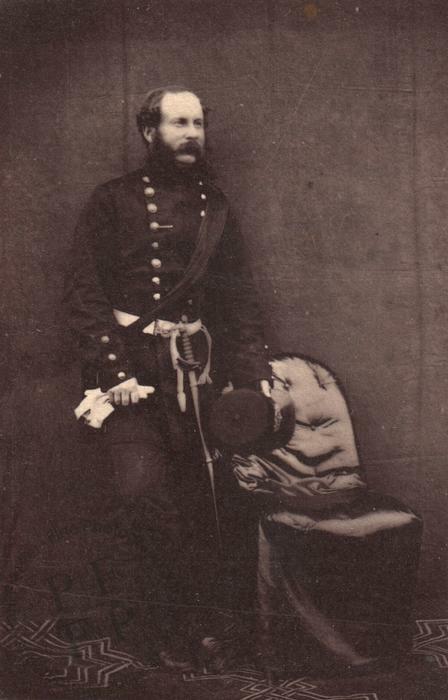 On 6 July 1861 the Volunteer Service Gazette reported that Heathcote had recently been promoted from Lieutenant to Captain in the service of the Huntingdonshire Rifle Volunteer Corps. In later years he became an Honorary Colonel in the 3rd Volunteer Battalion Suffolk Regiment and Honorary Colonel of the 1st Administrative Battalion of the Cambridge Rifle Volunteers. Verso presents another albumen print portrait, this one showing a younger man in civilian dress. The sitter is unidentified. Condition: the print presents a few small imperfections in the area of the background but is otherwise in very good condition. The album page presents a few faint marks and some minor edge wear but is otherwise in excellent condition. Dimensions: the print measures 3.1” by 2” (7.9 cm by 5.2 cm). The album page on which it is mounted measures 11.4” by 8.7” (29 cm by 22 cm).